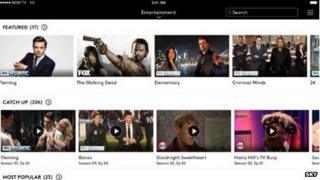 BBC and Sky's video-on-demand TV services have both experienced problems on iPhones and iPads. The fault appeared to be limited to iPlayer, Sky Go and Now TV on Apple's iOS platform and began last night. Neither organisation was able to provide a full explanation when asked, but the issues have now been resolved. The director of Now TV had earlier suggested that altering a device's date setting would act as a temporary workaround. "It's a Sky-wide issue, so it's both our app and Sky Go," Gidon Katz told the BBC. "It appears to be related to a date configuration. So, if you reset your iOS device to yesterday's date it would work. This could indicate that the issue is linked to an expired digital certificate. However, changing the date setting causes other problems. For example the owner becomes unable to access Apple's App Store. The action also failed to fix streams in either the iPlayer app or the service's website before engineers fixed the problem. A BBC spokesman said a "technical solution" had been deployed, but did not provide other details. This is the second technical fault that Now TV has experienced this month. Sky's subscription service - which targets people who do not subscribe to its satellite TV channels - crashed during the first episode of the latest Game Of Thrones season. Mr Katz said this was caused by a separate problem created by the challenge of servicing a large audience watching the same content simultaneously. "Last Monday was exacerbated by the fact that we had a football match on at the same time," he explained. "The sheer demand means we have to keep on improving our processes. "If you have large numbers of people watching Liverpool-Man City concurrently and Game of Thrones at the same time it's obviously going to put a much larger strain on our technical capability than people dipping in and out of [Netflix's] House of Cards, Orange is the New Black or any of those series." The HBO Go app also crashed while showing the same Game of Thrones episode to US audiences.